Whats the Best Way to Insulate Your House? © 2012 by Joe Symons; all rights reserved; content may not be copied, rewritten, or republished without authors written permission. As the cost of fuel continues to rise and the economic climate shows no sign of recovery any time soon its time to take a good at where you could be saving money. A good place to start is to take a look at your insulation if you find yourself facing huge energy bills over the winter and still find yourself in a cold drafty house. Time for some basic science; heat rises, and in a home with no insulation a quarter of your heat is lost through your roof. 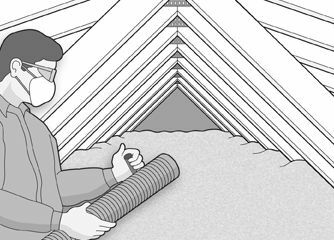 This is a huge proportion and insulating your loft, attic, or flat roof insulation is probably one of the most simple and effective way to prevent that heat loss. This may sound like a daunting job but it couldnt be simpler and is even something you can do yourself with a few basic tools. So go ahead and buy yourself some loft insulation and start saving money on those heating bills. With a life expectancy of 40 years loft installation will more than pay for itself. Insulation is available in both 4 batts and rolls. The choice is up to you, but in most cases rolls are easier to work with. 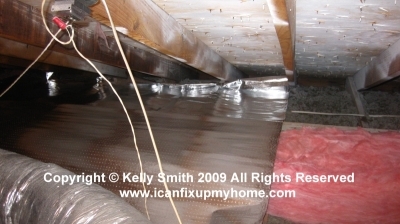 While youre up there, think about laying some radiant barrier foil on top of the insulation. In the summer it will keep the heat out; in the summer it will keep the heat in. Walls account for the greatest surface area exposed to the outside world and its thermal exposure. Therefore, its unsurprising that around one third of heat lost (or entering) in an uninsulated house is lost through the walls. Most houses, from the 1990s onwards, have been built with some form of insulation to keep heat loss to a minimum, so if your house was build before the 1990s you should definitely look into what insulation if any is in your walls. It is worth noting that even if your exterior walls are insulated, it can settle over time, so your walls might effectively be only half insulated. There are a couple of ways to insulate your walls depending on if you have cavity walls or solid walls. Cavity walls are usually comprised of drywall on the interior and siding on the exterior. Wood or metal studs separate the two and are usually on 16 centers. Cavity wall insulation is then placed between the studs. The material is usually fiberglass batts or spray foam. Solid walls on the other hand have no gap. This means there is no room for insulation inside the walls. This generally means solid wall insulation is placed inside or outside of your house between the wall and the siding. Both cavity and solid wall have their benefits, with solid wall insulation saving an average of approximately 1.8 tons of CO2 emissions. Cavity walls save somewhere in the region of 550 kg (1212.54244 pounds). The more you pay the bigger the reduction to carbon emissions and the bigger the reduction to your energy bills. Having double glazing installed in your home has an array of benefits to your home. First, by reducing your heating bills by up to £165 UK ($248 USD) a year for previously uninsulated homes. Next, they reduce noise from outside, saving a whopping 680 kg (1499.14338 pounds) of CO2 per year of installation. Finally, they reduce the condensation build-up and increasing comfort within the house helping eradicate cold spots and drafts. While double glazing isnt the cheapest option available, its still a very good option if you are looking to cut down on those bills. There are heaps of different options available in style, material, and even efficiency each with different price bands. Last but by no means least is floor insulation, with an annual average savings of £60 ($93.239948 USD) a year and a CO2 saving of 240 kg (529.109429 pounds) per year. Floor insulation, while not the best bang for the buck, is still a solid contender. In older buildings with suspended timber floors (floor joists), the insulation can take form of laying mineral wool or fiberglass supported by netting between joists. Modern homes floors with concrete slab foundations can be insulated if it needs to be replaced or can have rigid insulation placed on top of it. While each method of insulation is a positive step to improving the cost efficiency of your house, which method is right for your home depends on your budget, the current condition of your home, and personal preference. Keep in mind that in the US, most of these energy-saving upgrades are eligible for federal energy tax credits. Some power companies will give homeowners a rebate. Joe Symons is a keen blogger who is passionate about writing about any topics from paving in Portsmouth to double glazing Surrey.